We have made available access to update your personal information within the database of the church. Below is some information about it and the link is under the link section of this website. Above is a picture of what the page will look like after you are signed in. There are two distinct areas on this page. The first area is the LOGIN for those who already have access (Email Address & SIAA Password). To log in simply type in your email address in the email address field and then your SIAA password in the password field and click “Log On”. The second area is the “Need Your Login Information” for those who want to sign up for access and need a SIAA password sent to their email account. To generate a SIAA password type in your email address used in your church’s CMO in the email address field then click “Submit”. If your email address is on record with your church’s Church Membership Online Program your email address will generate a “Successful” completion notice and an email will be sent to your email account with your SIAA password and URL Logon address. If not, you will see a “NOT Successful” notice. If you receive this notice call your church and request they enter your email address into your Individual CMO Account. Once they confirm they have entered it, repeat the “Need Your login Information” again. If you want to change the password to one of your own preference: log in using the password given and choose the “Account” tab. IMPORTANT: If your email address has not been previously entered into your church’s CMO by your church Administrator you will not be able to generate a password for entry. Me.ChurchMembershipOnline features a HOME page allowing individuals to access five areas: Home, About, Personal Info, Contributions, and Account . The HOME page may also include birthdays and anniversaries of other members. We are considering other home page features as well. You can navigate to any area by selecting one of the tabs or linked statements on the HOME page. The first area is “PERSONAL INFORMATION” Select “Edit” to correct, update, and fill out general Individual contact information. When your select “Edit” a pop-up-window will appear with the title “Edit Personal Information”. Simply select the field area and make correction. When finished remember to click “SAVE”. 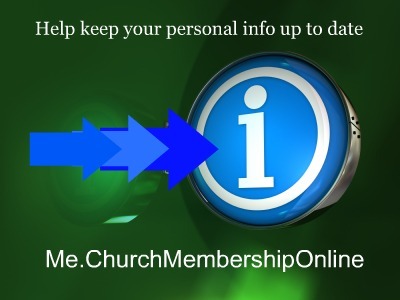 Information you save will automatically update your church’s Church Membership Online program. The second area is “HOUSEHOLD” Select “Edit” to correct, update, and fill out general Household contact information. NOTE: Only Head of Households will be allowed to “Edit” this area. When your select “Edit” a pop-up-window will appear with the title “Edit Household Information”. Simply select the field area and make correction. When finished remember to click “SAVE”. Information you save will automatically update your church’s CMO. NOTE : For the names of Individuals to appear in Household they must be entered in by your church’s CMO Administrator. You can correct the spelling of a name but you cannot add a new name. If a name is missing from your household please contact your church’s CMO Administrator. This section may be used at a later time, but is empty for now. This page allows you to assign a new password. Please make a note of your new password. Passwords are case sensitive make sure your caps key is off. This page tab is viewable only after you have signed in with your old password. Note: It is the responsibility of the Individual to protect their password access. So please use care in the storing and sharing of your password. This new program will help greatly in keeping your contact records accurate and current.